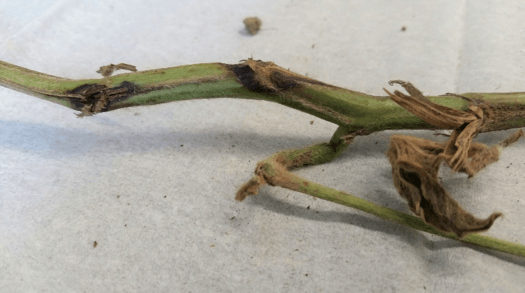 White mold, or Sclerotinia stem rot, caused by the fungus Sclerotinia sclerotiorum is the most economically important and difficult to manage disease of soybeans across NY State (Figure 1). This disease is so undermanaged because the pathogen survives for a long time (>10 years) in the soil, making crop rotations a challenging management option. Fungicide trials in other states have shown great promise for a number of products (https://www.ag.ndsu.edu/Carringtonrec/plant-pathology/fungicide-efficacy-testing-results-2013-soybeans), but application timing and canopy penetration is critical and may require multiple applications during a highly conducive season, which may not be economical. Genetic resistance to this devastating disease should be a viable option, but many commercial varieties lack even modest levels of resistance. A large-scale, non-replicated strip field trial was established in Genesee County to evaluate 24 soybean varieties for resistance white mold. The trial was organized by WNYCMA and planted on 5/1/18 in a field with a long history of white mold infection. The varieties evaluated in this trial included entries from five seed companies, and were representative of maturity groups 0.7 – 2.8. 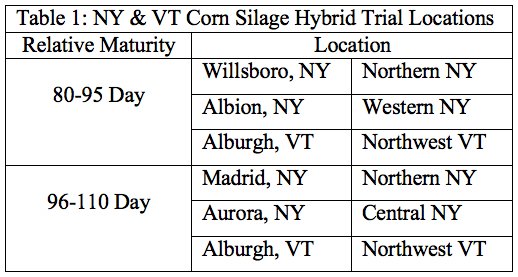 The trial was rated for white mold severity on 9/5/18 by Jaime Cummings of the NYS IPM Program and Dr. Gary Bergstrom of Cornell’s field crops pathology program using a 1 to 9 rating scale, where 1 = resistant, and 9 = susceptible. 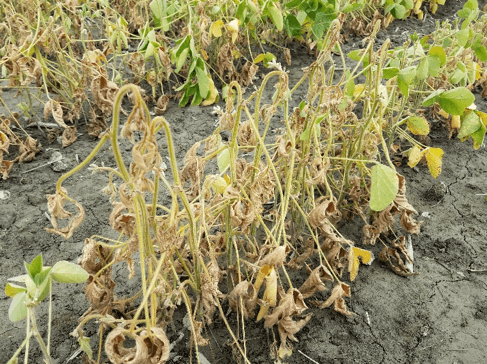 The disease was well established consistently across all strip plots at the time of rating, despite it being rotated out of soybeans since 2014. The disease ratings are summarized in Figure 2. Figure 2. 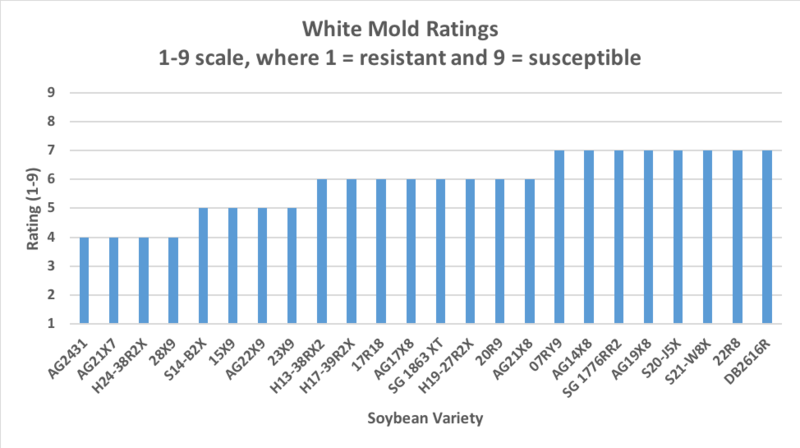 White mold disease severity ratings of 24 soybean varieties in a non-replicated field strip trial, rated on a 1-9 scale, where 1 = resistant and 9 = susceptible. The ratings for all varieties ranged between 4 and 7, meaning that all varieties were classified as moderately resistant (3.6 – 5.9) or moderately susceptible (6.0 – 7.5) at the time of the rating. However, the disease would most likely progress in these plots over time, which would likely add one or two points to each rating, pushing many of them into the susceptible category (7.6 – 9). Even though none of the varieties evaluated showed strong resistance, it is good to note that there are noticeable differences among varieties. New York soybean growers do have options for selecting varieties with some moderate levels of tolerance to this disease, and should know to avoid planting the most susceptible varieties in fields with a history of the disease. 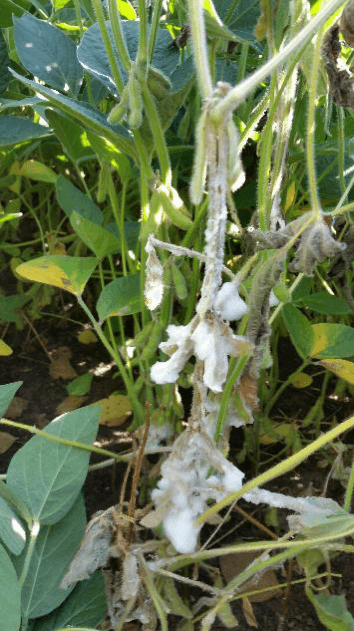 An integrated management plan which includes crop rotation, canopy management, foliar fungicides and planting tolerant varieties is the best approach to managing white mold in NY. For more information on white mold of soybeans in NY, please see the soybean white mold disease page on fieldcrops.org (https://fieldcrops.cals.cornell.edu/soybeans/diseases-soybeans/white-mold-or-sclerotinia-stem-rot/). For information on other soybean diseases and their management options, please visit the Diseases of Soybeans section of fieldcrops.org (https://fieldcrops.cals.cornell.edu/soybeans/diseases-soybeans/). And, check out the soybean disease survey pages (https://fieldcrops.cals.cornell.edu/soybeans/diseases-soybeans/soybean-disease-survey/). 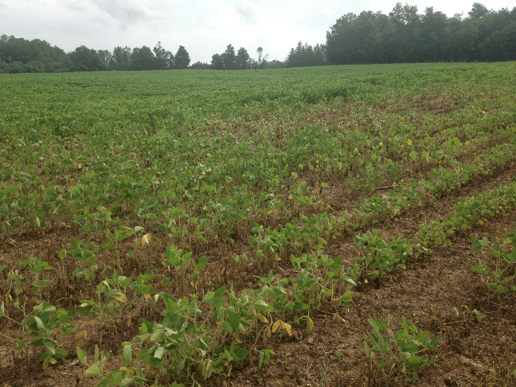 Reports, photos and samples have been pouring in with regards to dying soybeans from western and central NY counties. Some people report general chlorosis and wilting, and others are finding swaths of dead plants. 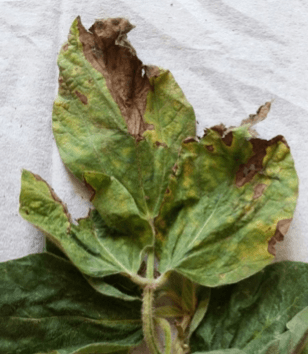 The drought conditions experienced in some parts of the state this year may have lulled some of us into thinking that we might be spared from some of our typical soybean diseases. And, it’s true that foliar diseases have been nearly non-existent this season. But, some of our important soilborne diseases are now rearing their ugly heads, and some of us are scratching our heads to figure out which is which. Since many of these diseases tend to have similar general symptoms, especially early on, it’s important to get an accurate diagnosis to make any management decisions for both this season and future variety selections. Thus far, I have confirmed Phytophthora root and stem rot, northern stem canker and Fusarium wilt in a handful of fields, but these problems are likely more widespread and we’ll probably continue to see more samples. 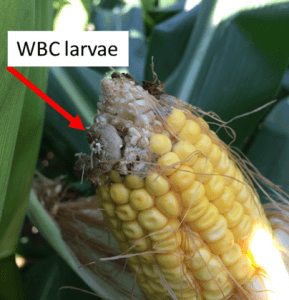 Managing these soilborne diseases can be challenging, and requires an integrated approach. When a soilborne disease is identified in a field, you may need to implement multiple tactics, including resistant varieties, crop rotations, residue management, field drainage improvement, alternate weed host management, seed treatments and foliar fungicides where applicable. Below is more information on some of the diseases of concern identified, thus far, this season. 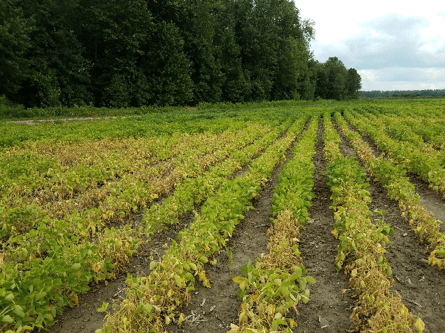 Phytophthora root and stem rot, caused by Phytophthora sojae is a complicated soilborne disease of economic concern in soybean production areas of NY. It has been confirmed in at least nine counties in NY, and it is likely more widespread throughout the state. As with most of the soilborne diseases, occurrence depends on favorable conditions, including cool and wet conditions and compacted soils at planting time. The disease is exacerbated by flooding of fields after seeding has occurred. The 2018 growing season has been ideal for this disease in some parts of the state, given our prolonged wet spring and recent heavy rain events causing saturation in some fields. The pathogen survives long-term in the soil as hardy oospores. These oospores germinate to produce sporangia that release the swimming zoospores which infect the soybean roots or are splashed up into the canopy. Infection of seedlings often results in damping off. Symptoms of infection of older plants include lesions beginning at the soil line and extending up the stem, yellow/chlorotic leaves, wilting, reduced vigor, reduction in root mass and death. We are currently seeing these symptoms in plants in various reproductive stages. Over 70 races of this pathogen exist, making management with resistant varieties challenging without knowing which races occur in a particular field. However, varieties with partial resistance (also called field tolerance), which adds some level of protection against all races, are available and highly recommended. Improving soil drainage, reducing compaction, utilizing seed treatments, genetic resistance, and crop rotation are good tools for managing Phytophthora root and stem rot. Northern stem canker, caused by the fungus Diaporthe caulivora, is a disease of economic concern that was first identified and confirmed in NY in 2014. Since the initial confirmation, it has been discovered to be fairly widespread throughout many soybean production areas in NY, though usually only at moderately low incidences. We are starting to see it in western NY this year, and expect to find it more widespread as favorable weather conditions continue. The pathogen survives on infected soy residue, and infection often occurs during vegetative growth stages, but symptoms don’t appear until reproductive stages. Foliar symptoms include interveinal chlorosis, followed by necrosis, and is indistinguishable from the foliar symptoms of other soilborne diseases including sudden death syndrome and brown stem rot. Initially, small reddish-brown lesions appear, often near nodes on the lower stems, which expand into distinctive ‘cankers’ with slightly sunken, grayish-brown centers and reddish margins. Large cankers may girdle stems completely. 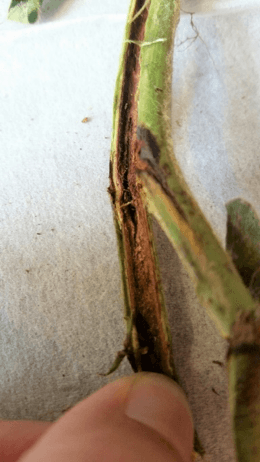 Splitting stems longitudinally may reveal a browning discoloration of the vascular tissue and pith, often more pronounced near the nodes on the lower stems, similar to what is observed with brown stem rot. In severe cases with large cankers, the entire pith may be brownish-red. The disease reduces the number and size of seeds produced, and could result in yield losses of up to 50% in a severe epidemic. It is important to note that there are two forms of stem canker; 1) northern stem canker, and 2) southern stem canker. Southern stem canker has not been identified in NY. Each disease is caused by a different pathogen, and controlled by separate resistance genes. Because northern stem canker was dismissed as a disease of minor importance in the 1950s, most seed companies do not provide disease ratings specific for northern stem canker in their catalogs. Most ‘stem canker’ ratings in commercial seed catalogs are for southern stem canker (unless noted otherwise), which is a disease of great importance to many soybean production areas of the U.S., but have no relevance to northern stem canker resistance. Foliar fungicide applications for management have shown inconsistent results, and may not be cost effective. Tillage practices to bury infected residues and rotation with non-host crops, including small grains or corn, are recommended for highly infested fields if varieties with resistance specific to northern stem canker are not available. 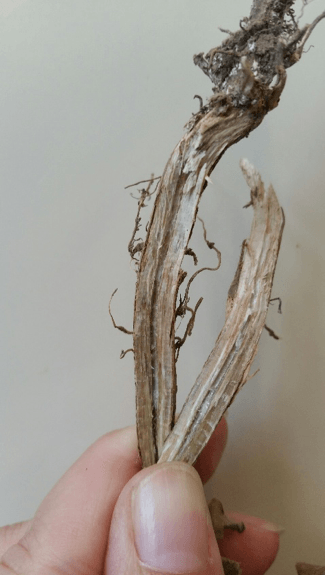 Fusarium wilt, caused by a number of Fusarium species, is a fungal soilborne disease of concern in soybean production areas of NY, particularly in years with drought, like we are experiencing in 2018. Though it has only been confirmed in a few counties, it is likely much more widespread, but is difficult to diagnose or differentiate from other diseases or stresses. It’s easiest to rule out other diseases, like Phytophthora root and stem rot, northern stem canker, charcoal rot and brown stem rot to arrive at an accurate diagnosis. Infection is favored by cool temperatures and wet soils during early vegetative growth stages. Plants are infected during early vegetative stages, but symptoms appear later in the season during reproductive stages, and are exacerbated by hot, dry weather, when infected plants begin to wilt. In addition to wilting, symptoms include brown discoloration of the vascular system in the roots, crowns and stems, and foliage may become generally chlorotic and defoliation may occur. 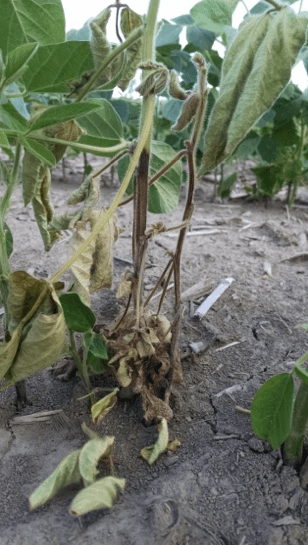 Sometimes, the general wilting and chlorosis are overlooked as heat stress, and the full extent of the disease in a field doesn’t become evident until many plants in a field die. Reducing soil compaction, delaying planting until soil temperatures are favorable for seed germination, crop rotation and seed treatments applied to high quality seed are good management practices for minimizing losses to Fusarium wilt. 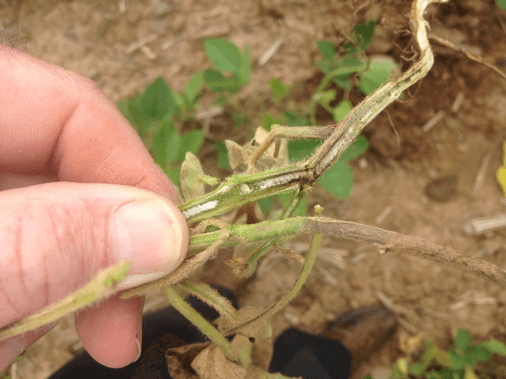 There can be a lot of overlap in symptoms among many soilborne diseases of soybeans. Be sure to arrive at an accurate diagnosis before making any decisions. And, remember, when scouting and collecting samples for submission for diagnosis, the diagnosis you receive is only as good as the sample you submit. Be sure to collect whole plants, with roots, and ship them overnight to ensure they arrive in good condition. Information on how to submit specimens for diagnosis is available on the Cornell Plant Disease Diagnostic Clinic website http://plantclinic.cornell.edu/pddcforms/submissionform.pdf, and a submission form is available at http://plantclinic.cornell.edu/pddcforms/submissionform.pdf. And, for more information on soybean diseases in NY, please visit the soybean disease survey portion of fieldcrops.org (https://fieldcrops.cals.cornell.edu/soybeans/diseases-soybeans/soybean-disease-survey/).